All New EZOPower Detachable Power Strip provides a practical charging solution and easy sharing power with coworkers, classmate, or family. 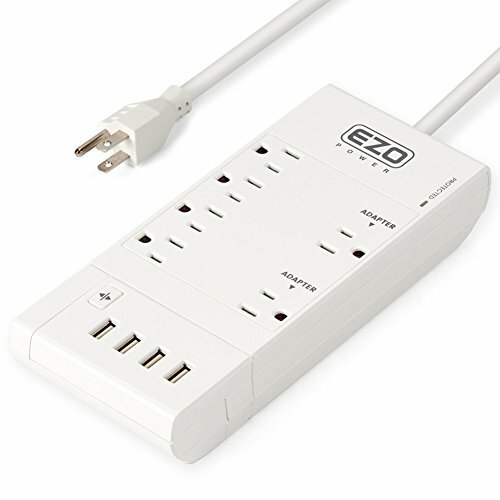 [ ENDLESS POWER ]: Total 6 AC Outlets with 6ft power strip cord offers simultaneous charging multiple devices at home, the office, or while traveling. Including two wide spaced outlets, perfect for large adapters without blocking other outlets. [ MULTI-FUNCTIONAL ]: Detachable clamp design 4 3.4A USB ports makes it convenient to attach to the edge of the table or hang across the office partition. Retractable extension cord for up to 5 ft.
[ SAFETY & STABILITY ]: Features advanced X3 MOV Chip Technology and fire-proof ceramic encasing surge protection. UL certified and 1080 Joules Surge Protector for optimum protection and charges up to 10 devices. [ COMPATIBILITY ]: Charge your smartphone, powerbank, Bluetooth headphones, portable speakers, tablet pc, laptops, ultrabooks, digital camera chargers all at once! Suitable for USB powered devices such as Apple iPhone 8 / X / 7 / 7 Plus, iPhone 6s / 6s Plus, iPad Air / Pro, Microsoft Surface Pro Tablet, Samsung Galaxy Tab A / Galaxy Tab S3, galaxy Note 8, Galaxy S8+, S8, S7, LG G6, G5, G4, V10, G4, K7, Nokia Lumia Series, HTC One, M1, 10, M9, Motorola Moto G Plus, G5 Plus, G5, Moto E, and more. If you have any questions about this product by EZOPower, contact us by completing and submitting the form below. If you are looking for a specif part number, please include it with your message.